DETAILS: This monogrammed Matte Black Flask & Shot Glass Gift Set comes with a 6 oz. flask made of stainless steel and includes four ultra-cool shot glasses. MEASUREMENTS: 3 1/2" x 3 3/4" x 3/4". 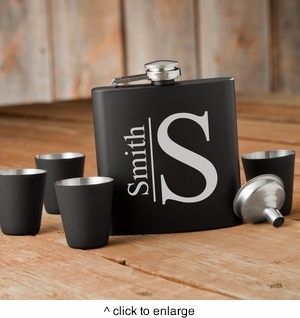 MARKETING: Flasks, Father's Day, Groomsmen Gifts.